October 7th, 2014 | Wheaton World Wide Moving. The customer experience (CX) is no longer a series of independent interactions customers have with the various touch points in our organization; it’s an ongoing dialogue between Wheaton World Wide Moving and our customers. This journey begins when customers are deciding which van line to choose to move their household goods on an interstate move. While some might view the customer relationship ending when the move is complete, the reality is the dialogue continues in the form of our customer surveys, referrals of our company to family and friends (which, by the way, happens to be our biggest source of new customers), repeat business with former customers and online reviews posted to social media. Engaged customers are those who continue this dialogue with us. They are loyal enough to refer us to others and/or continue to use us for their future moves. If these customer behaviors are our end goal, then how can we get our customers engaged with Wheaton World Wide? Providing a personal customer experience is the key to engaging our customers. That said, we are fortunate this challenge should be easier to accomplish in the moving and storage business than in other industries, since our service is a highly personal one. We are in our customers’ homes, handling their belongings and interacting with members of their family, including their children and pets. In addition, generally speaking, most people do not make multiple interstate moves during their lifetime, but when they do, the experience is a major life event due to the significant expense and stress. 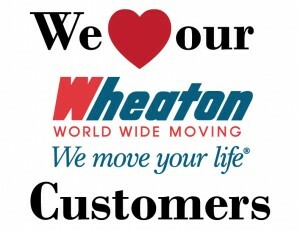 Because of these factors, when Wheaton does an excellent or poor job, customers feel strongly enough about our performance to let us know. This is one of the reasons why we have such a great response rate to our customer surveys – currently 55% for our electronic surveys. What does this mean? Well, simply by the nature of our business, all of our customers have the potential to be highly engaged. And if the Wheaton World Wide customer experience is affected by every touch point in the organization, then all of our employees, agents, drivers and crew members impact CX in some way. Tuesday, October 7th, marks the second annual CX Day, and at Wheaton World Wide we are celebrating our customers during the entire week of October 6 – 10! Just like we showed gratitude for our drivers during Driver Appreciation Week, we will continue this successful marketing campaign and show appreciation for our customers by having our agents, drivers and employees take pictures of themselves (and customers, if possible) holding “I ‘heart’ customers” signs and upload these images to our social media sites. We look forward to a fun and memorable CX Day! Wheaton World Wide Moving employees helped create a poster with their hand prints to signify all hands are involved every move.